This PDF 1.5 document has been generated by Foxit Software Inc. / Foxit Reader Creator Version 7.0.1.831, and has been sent on pdf-archive.com on 08/12/2014 at 11:03, from IP address 117.131.x.x. The current document download page has been viewed 341 times. File size: 3.5 MB (38 pages). 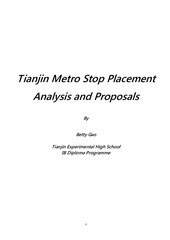 study, since as a high school student, I was not able to spend a large amount of time and resources to analyze the placements. that I am unaware of. which is ineffective to most people. Diagrams above are general; I shall give a more specific diagram in next stage. Map of Problem Stop #1, satellite view and road map. We can see from first sight, there are not many buildings or places contained by people near the green stop. station. No other buildings or location holds a large grouping of people. 500~600 people is estimated in Taxation School. This file has been shared by a user of PDF Archive. Document ID: 00198074.